Somehow winter passed, and I didn’t make a single pot of tomato soup. Somehow spring arrived, and six inches of snow still covers my lawn. 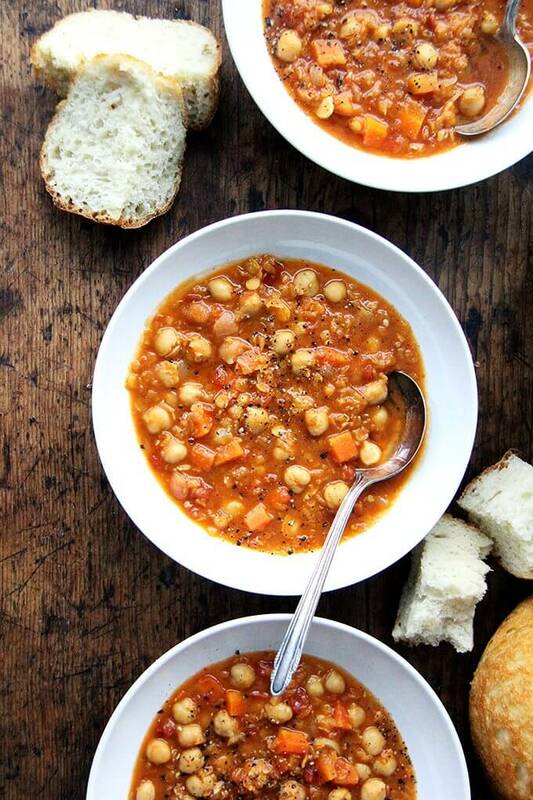 I’m craving rhubarb (cooking with it a little, too), but living on beans and bread; still making soup all the time. 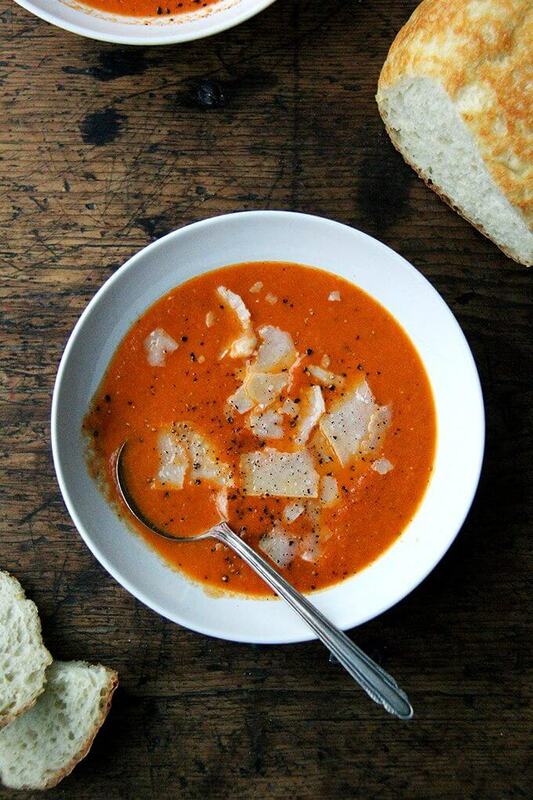 Here’s the latest: creamy tomato soup from a 2012 Bon Appetit. 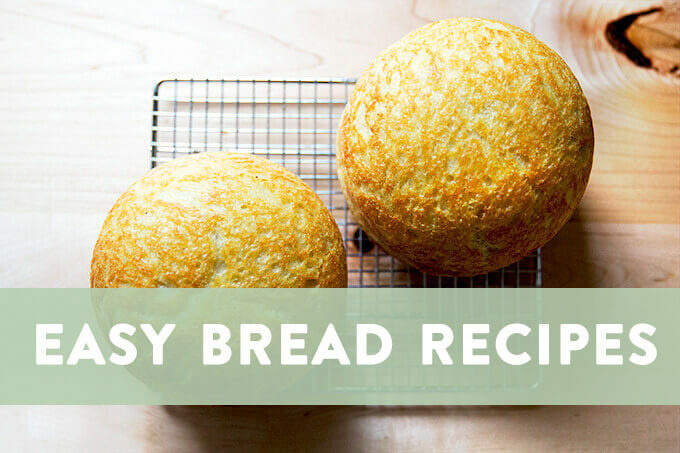 The recipe is incredibly simple, calling for nearly all pantry items: onions, garlic, tomato paste, and canned peeled tomatoes. You may have to add thyme to your shopping list, though I made it once without it, and it turned out fine. You might also need to pick up some heavy cream, which could be omitted, but I think it adds a necessary touch of richness—the soup is made with water (as opposed to stock), and a little cream goes a long way here balancing the acidity and sweetness of the tomatoes. I like to serve the soup with lots of freshly cracked pepper and shaved parmesan and bread, of course. I’ve been making a half recipe (reflected in the ingredients below), which never lasts the day, so feel free to double it. Melt butter in a large heavy pot over medium heat. 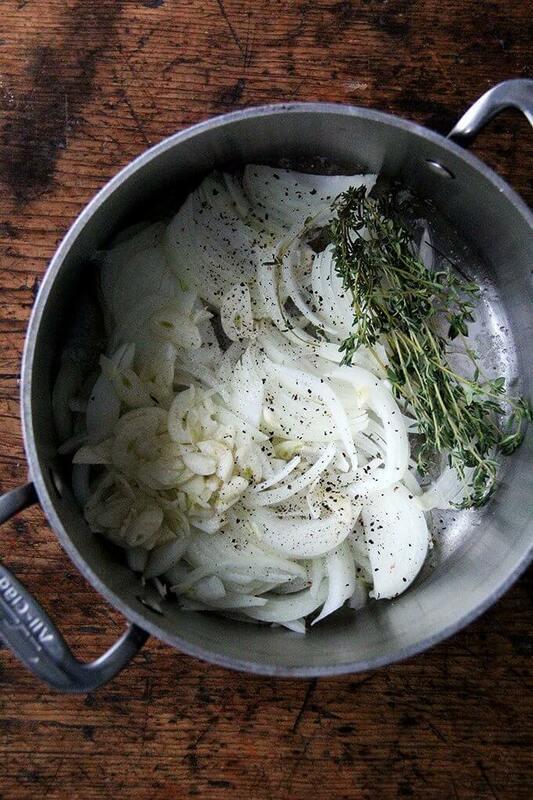 Add thyme, onion, and garlic. Season with salt. Cook until onion is completely soft and translucent, 10–12 minutes. Increase heat to medium-high; add tomato paste. Continue cooking, stirring often, until paste has begun to caramelize in spots, 5–6 minutes—it will begin to stick to the bottom of the pan. 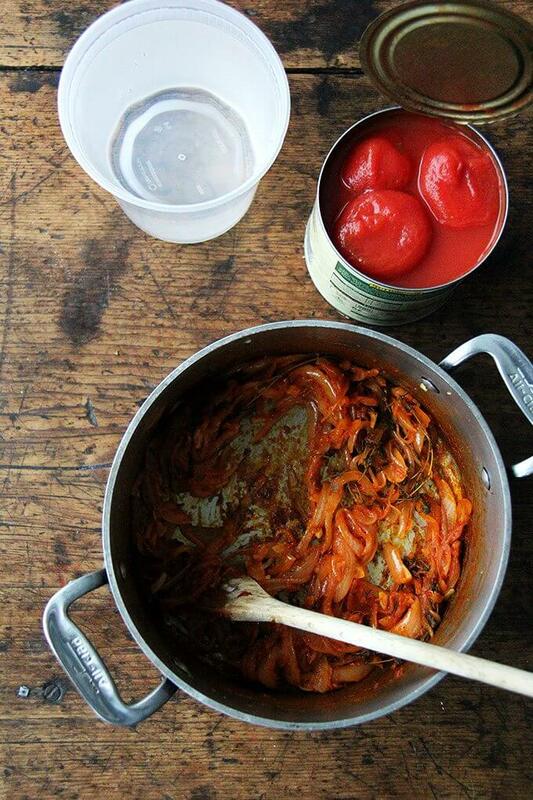 Add tomatoes with juices and 4 cups water to pot. Increase heat to high; bring to a simmer. 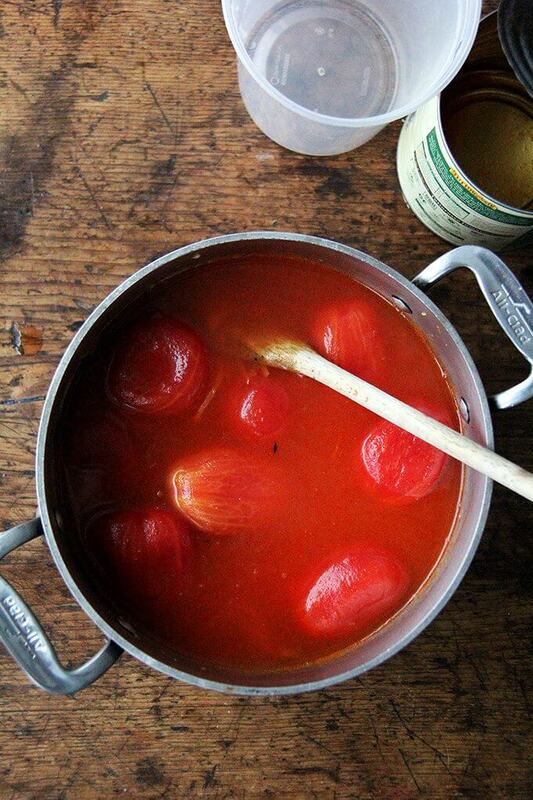 As the plum tomatoes rise to the surface while the soup simmers, use scissors to cut them up. (You’ll purée it later, but somehow I think cutting them up, helps them cook down better.) Reduce heat to medium. Simmer until flavors meld and soup reduces to about 1 quart, 45 minutes or so. Remove soup from heat; discard thyme sprigs. Working in small batches, purée soup in a blender until smooth or purée with an immersion blender. Stir in ¼ cup cream. Taste and adjust as needed. I like adding the teaspoon of sugar, and I add at least a teaspoon of kosher salt (probably 1.5 teaspoons, but I like salt, so season to taste). I like lots of fresh cracked pepper, too. Simmer soup until flavors meld, 5 to 10 minutes longer. Taste again, and add more cream, if desired. 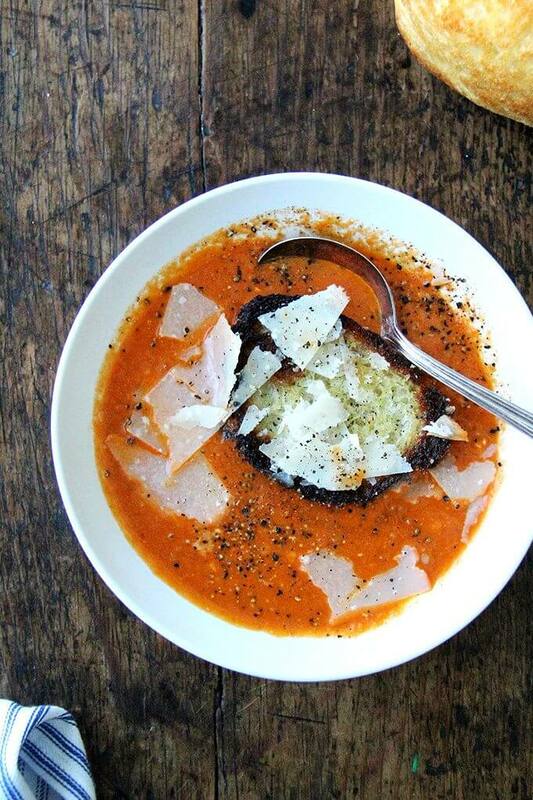 Ladle soup into bowls and shave Parmigiano Reggiano over top. Serve with more pepper on the side and bread. Looks yummy! Do you have a favorite brand of canned tomatoes that you prefer? When I buy crushed tomatoes, I love the Pomi brand. 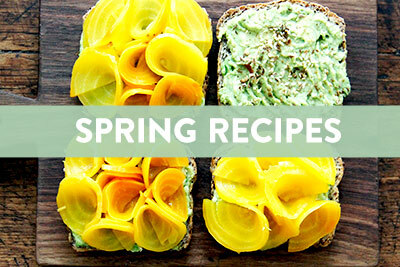 Delicious recipe, and very wonderful blog. Grazie Alexandra! I used to buy the excellent Pomi crushed tomatoes when I was in the States, but here in Italy, that particular Pomi product is not available! So strange, as it is an Italian brand. I still have not found a good equivalent here. At least we have our splendid Parmigiano!! Ciao! Too bad about Pomi — so funny. I have it simmering on the stove right now! It was such a mild winter the thyme in the garden is still still green. Fifteen more minutes! Yay!! 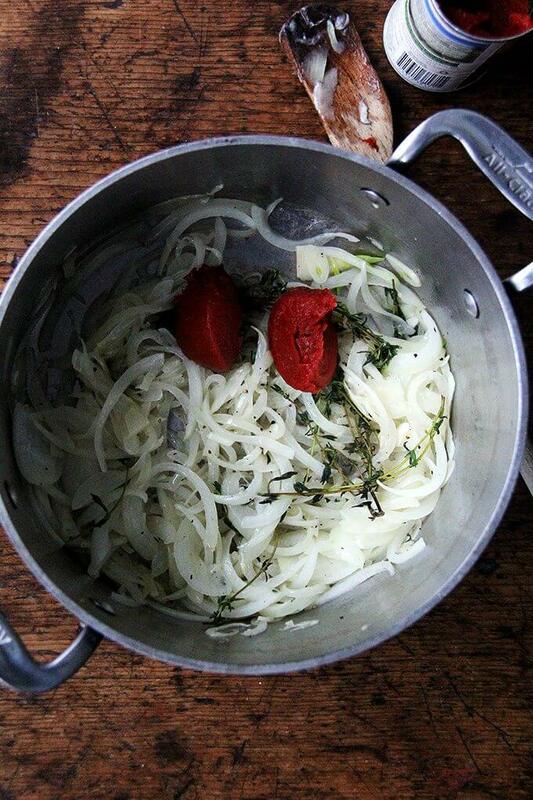 And how nice—very jealous you have fresh thyme in your garden this time of year (actually any time of year :)). So happy you’re making this! I can’t get enough of it. Just a general comment. Alexandracooks is one of my, if not THE, favorites. The photos are a phenomenal addition to the recipes. 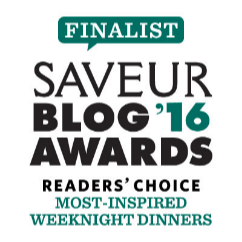 I look forward to the emails and have had great results with the recipes. Thank you!!! You are too kind. Means so much. 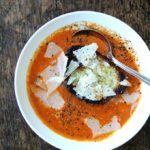 Love tomato soup and this recipe are super EASY! 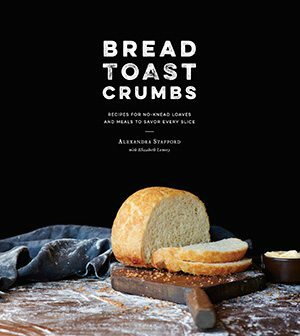 The toasted crusty bread is so inviting! So happy to hear this Mary Ann. Dead simple and yummy! My kind of recipe. I wonder if it would be goof with prawns ?? Loved it! I used Pomi crushed tomatoes which was a few ounces shy of the 28 oz. called for the recipe, so, in keeping with the pantry theme, I just added a can of chopped tomatoes and it worked out fine! Thank you for this great recipe. So fresh and delicious. As always, you post such excellent recipes here 🙂 Very pleased with this tomato soup. I found it a bit tart though, so upped the cream to a little less than half a cup. Will be serving this with some bread and olive oil from the farmer’s market (they are back for the spring here in my neighborhood in NYC!). Thank you! 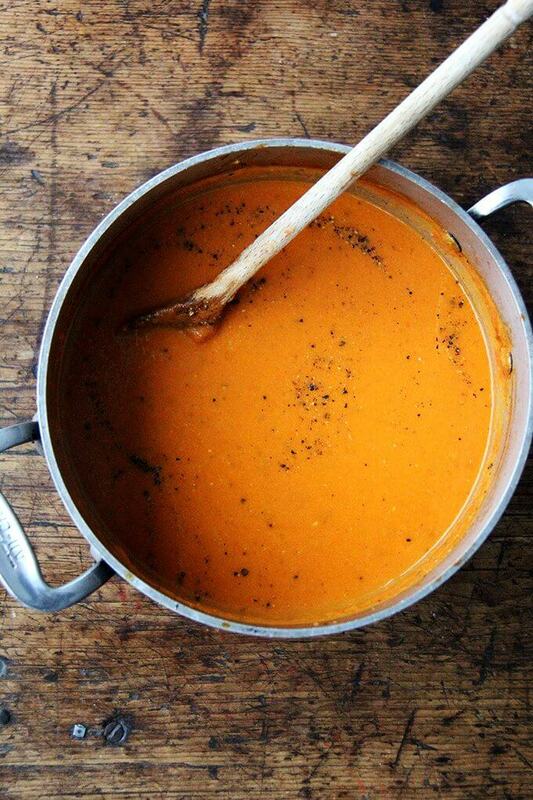 This is a great tomato soup recipe, thanks! I was finally able to make this for the first time tonight along with a loaf of peasant bread (a favorite). 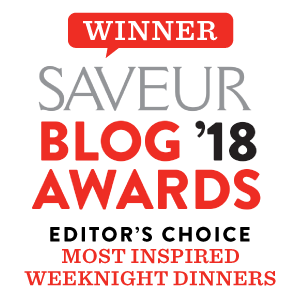 Thank you for sharing such wonderful recipes!! Both were wonderful! Made this tonight and it was superb! My two year old even thanked me for making it! It will be my new go-to. Thank you for posting this simple gem. Yay! So happy to hear this, Rebecca! What an easy and incredible recipe! Definitely one I plan on keeping. I made this tonight for the second time. The first time I followed the recipe exactly. This time I doubled it and added a tablespoon of bacon grease which added a different, but still delicious flavor. I’m also in the process of making your food processor danishes, so I had some extra ricotta (also a recipe of yours) that I dolloped into the soup. Best decision I made today. All of your recipes are well thought out and always incredible. Thank you so much! Terrific, as ever! Made this yesterday and tossed in some leftover roasted veggies that didn’t fit in my lasagna pan, served it with sweet potato cornbread and salad. Brilliant. Yum and yay!! I made this last night for dinner, too. My oldest daughter loves it and requested it … makes me so happy. Sweet potato cornbread sounds amazing!! It was! Am I allowed to plug someone else’s recipes here? Or have you got one up your ample sleeve? I would absolutely LOVE the recipe! Please share. Thank you!! It was indeed a very “pantry” dinner: I had no sour cream, so just used plain, full-fat yogurt. Worked a treat. Thanks so much for sharing! Love Budget Bytes and Beth—she’s awesome. Can’t wait to give it a go. We have so many sweet potatoes in our CSA. I’m a child of Italian migrant parents and I’ve always avoided eating or cooking tomato soup because it feels odd to eat anything tomato soup based without some pasta, beans and vegetables added!! Your beautiful photography and the hunk of bread and mountains of parmigiano convinced me to try this recipe!! Yum!! I will never turn my nose up at tomato soup again ???? 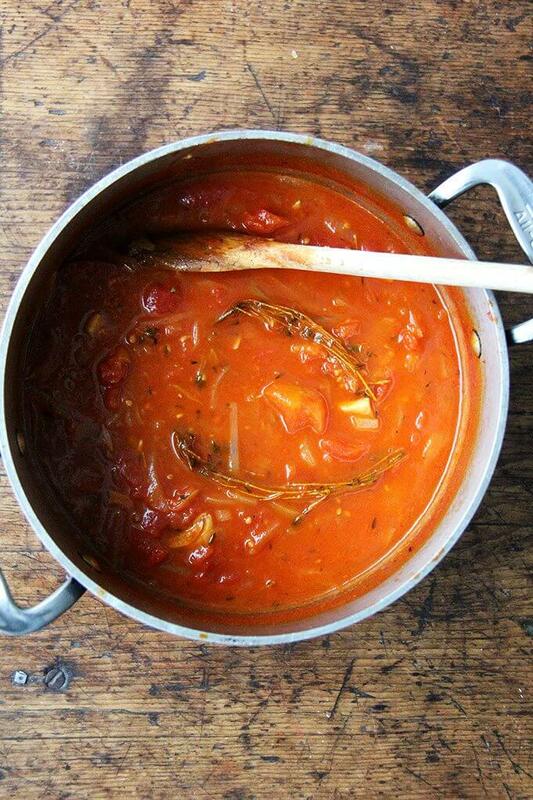 I use San marzano and the Cirio brand pomodorini di Collina interchangeably and they both create equally tasty soup! Thanks again for your recipes. 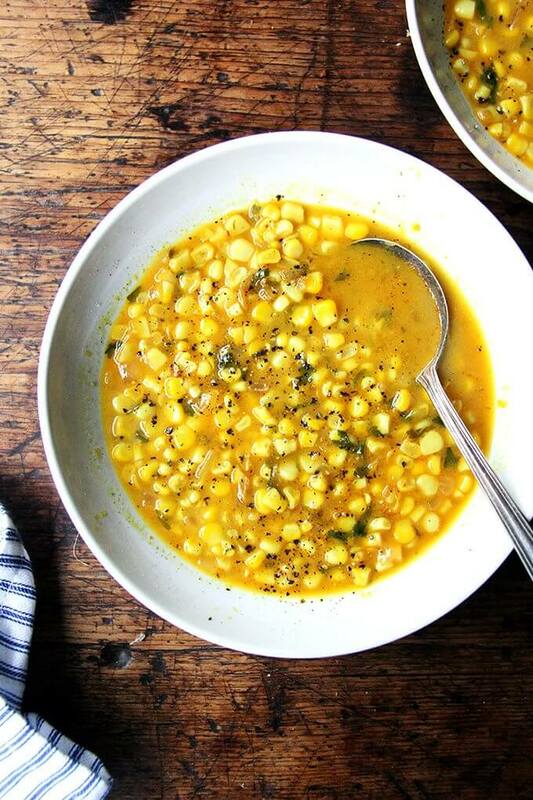 Your leblebi soup is also a family favourite! So happy to hear this, Diana!! I love the Cirio brand of tomato products, too—it has such a nice, clean flavor. And I’m so happy you love the leblebi, too. 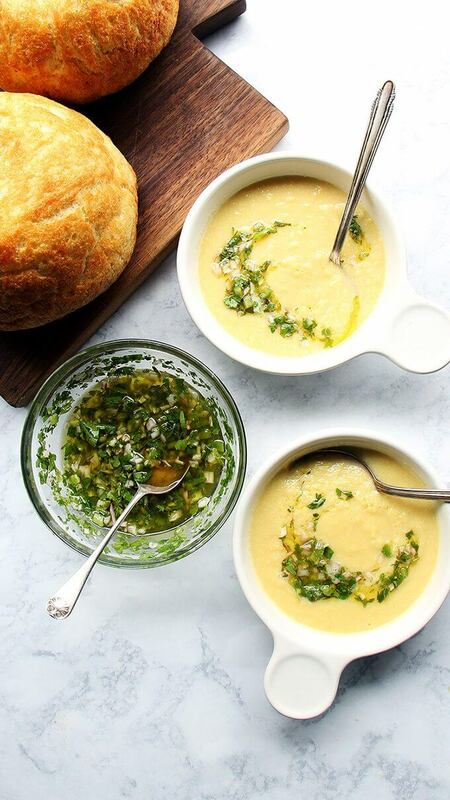 Both of these soups are staples for me all winter—I love that they materialize from pantry ingredients, but taste so fresh in the end. Thanks for writing! This was a hit on a cold blustery day! In the past, I have found tomato soup to be a bit blah, but not this one. Thinking it has to do with the cooking down of the onion/garlic and I let it simmer close to an hour. Heaped in lots of freshly cracked black pepper. The shavings of parmigiano reggiano are delightful and I added sugar to counter acidity. Thank you once again for something delicious to eat!